It is our privilege to be a co-sponsor of events in the David Dorfman Performance Residency! 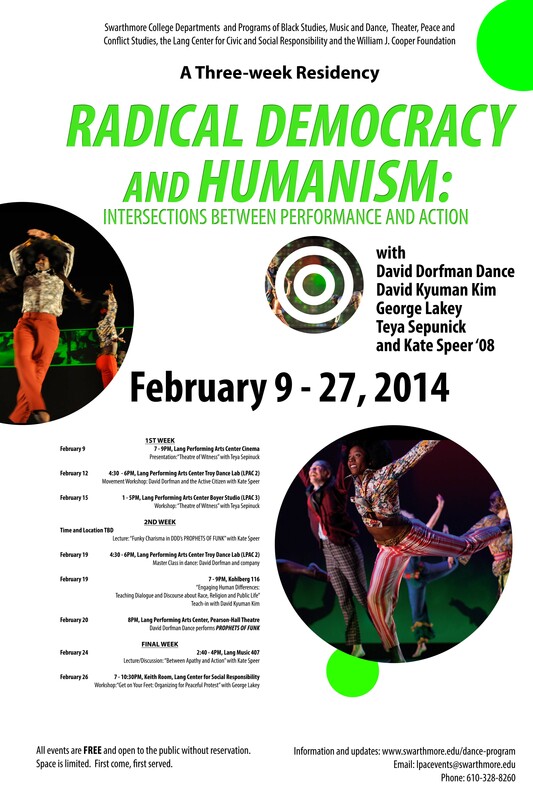 Swarthmore College (Departments and Programs of Music and Dance, Black Studies, Peace and Conflict Studies, Theatre, and the Lang Center for Civic and Social Responsibility) and the William J. Cooper Foundation present a three-week performance residency RADICAL DEMOCRACY AND HUMANISM: INTERSECTIONS BETWEEN PERFORMANCE AND ACTION. Conceived by Professor Sharon Friedler and led by Swarthmore graduate Kate Speer ‘08, the residency centers around engagements with David Dorfman Dance (DDD), a leading American modern dance company known for politically relevant works centered on community responsibility. From February 9 to February 27, 2015, workshops, classes and lectures will address a spectrum of positions and assumptions regarding intersecting issues of race, class, gender, sexuality, religion, politics and the environment. Participating facilitators include the following scholars and artists: Kate Speer ‘08, who has written and delivered papers on Dorfman’s dances, creative processes, and their connection to radical democracy, Teya Sepinuck, the founder and director of the Theater of Witness model of performance, David Kyuman Kim, a Connecticut College scholar of race, religion, and public life and George Lakey, visiting professor, non-violence advocate and civil rights activist. In the lectures and workshops, selections of David Dorfman’s repertory works will be taught as aids in broadening individual performing range and exposure to these processes will provide a common basis for the study and discussion of different aspects of performance. Discussions will delve into multiple opinions and perspectives in order to encourage participants to begin dialoguing about the questions at stake, effectively employing democratic practices within the concert stage environment. The residency will seek to explore how Dorfman creates dance that de-stigmatizes the notion of accessibility and interaction in post-modern performance and how dance can add a positive challenge to engage audiences in action. All events are free and open to the public without reservation. Seating may be limited for some events and is first come, first served. The central performance event, David Dorfman’s PROPHETS OF FUNK, is on Friday, February 20 at 8PM is in the Lang Performing Arts Center’s Pearson-Hall Theater. DDD celebrates the band’s groundbreaking, visceral, and powerful visions of prophetic love that continue to shine on despite everyday struggles. PROPHETS OF FUNK lifts up the spirit of Sly: that in the face of the funk of life, there are still hopes and aspirations that reside in all of us. The production of PROPHETS OF FUNK was made possible by generous support from The Andrew W. Mellon Foundation, the National Endowment for the Arts, The Harkness Foundation for Dance, The New England Foundation for the Arts, National Dance Project with funding from the Doris Duke Charitable Foundation, The Fan Fox and Leslie R. Samuels Foundation, New York State Council on the Arts, The Jerome Robbins Foundation, and Friends of David Dorfman Dance. Choreographic material for PROPHETS OF FUNK was developed, in part, during residencies at the Tisch Dance Summer Residency Program at New York University and as company-in-residence at Connecticut College.